Payday is a game many of us grew up with and it hasn’t lost its appeal. Its easy to follow format and twists and turns keep it interesting and fresh while still being accessible to younger players. 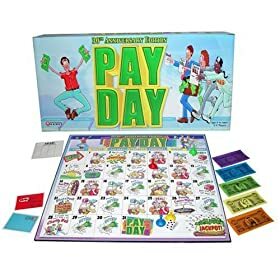 Although it may seem that eight is a bit young to start teaching your kids how to manage debt, the truth of the matter is that the Payday board game helps lay the foundation for solid decision making when it comes to money. Gambles in the game can pay off, but it’s often the more strategic players that win the race. After setting up the board and placing the cards on their corresponding spots, players decide how many months they are going to play for. The players can then begin rolling and earning their pay checks. There are many event cards, mail cards and deal cards along the way that will challenge players’ decision-making abilities. The goal of the game is to strategically buy and sell while making sure to manage your loans. lot of interaction for all players and each turn is quick enough that younger players will not get bored. Making good use of loans to buy deals will often help you have the most money at the end. Players who buy infrequently rarely end up winning. Though there is some luck involved in paying the game, players will find that as their money management skills improve, so will their chances of winning. Payday has been around for many years and as such shows that it has lasting appeal. Payday is a fun game to play for all ages and will appeal especially to the younger end of its age spectrum. There are many jobs to take care of and players are always drawing cards and making decisions, which keeps everyone involved and engaged in the game. Older players may tire of the game after two or three game months, as there is some chance involved in the game and it can be slightly repetitive after more than two months. Easy to set up and quick to play, the Pay Day board game is a great family game. Kids and adults alike will enjoy making and spending money. With the ability to set the game's length, players can play for however long they have time for, making Payday a great before bed adventure. i played pay day when i was a kid in 1975 what a great game.